Did you know that there are a measurable amount of homes sold after zero days on the market? Yep it's true, and it is something we need to explore to understand our current real estate market changes. If you read yesterday's article (Tallahassee MLS Real Estate Listings Mystery Revealed), then you know we're trying to figure out how a crazy new trend in the housing market is going to play out. We received a lot of great ideas and feedback from readers, and we are going to use their input to broaden our analysis of this rapidly developing change in the Tallahassee real estate market, and we'll start off with the concept of "days on the market." I am not going to get back onto my soap box to rant about the misuse of the "time on the market statistic," but you can read all about Realtor trickery here if you are interested. Instead, we are going to explain how this measurement can help us spot a trend that might reveal the mystery we identified yesterday. First of all, the MLS (the Realtor Multiple Listing Service) is a tool used by Realtors to promote our property listings among each other and to consumers via syndication across the internet. So in a nutshell, we put a property in the MLS to tell other Realtors that it is available. But we have come to rely on the MLS for statistics about home sales, so most real estate agents will put all their transactions into the MLS, even the ones they have sold before they could get it into the MLS. This often happens with new construction pre-sales and in very, very active neighborhoods. So when an agent enters a property sale into the MLS "after the fact," they do it to provide comparable sales information for themselves and others in the future. These listings are usually entered in rapidly, and the primary focus is to put the home price, address, size, and basic information to be used for valuations of similar properties. But this typically means that details like the time it was first offered for sale, the date the contract was received, and thus the length of time on the market are not measured. Days on the market for these types of listings equals zero. The good news is that we can track all closed home sales with zero days on the market to determine if they are having a huge impact in the market. In fact (and the reason we are explaining this), this was one of the "best" potential explanations for why our new contracts are dropping, all the while new closed home sales are on the rise. 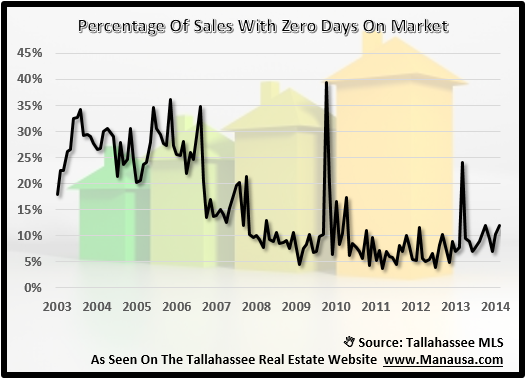 If the trend of "zero days on the market" listings is on the rise, it would explain the mystery in the Tallahassee real estate market. Unfortunately, this is not going to be the answer we were seeking. 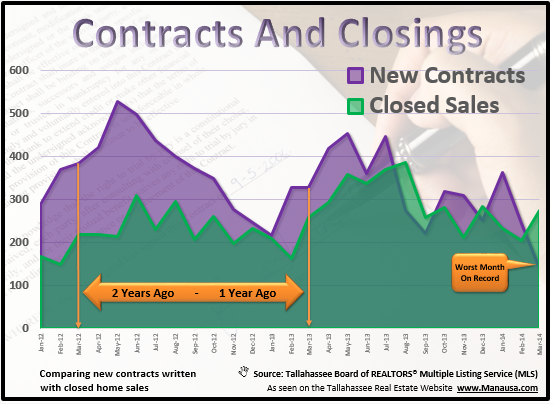 Roughly 11% of the homes sold last month had zero days on the market, which is entirely consistent with what we have observed in the past in the Tallahassee MLS. There were quite a number of other good ideas and comments too, and you can read those in the comments section of yesterday's post. The purple shaded area measures the number of new contracts written each month, while the green shaded section measures the number of closed home sales each month. This crazy new trend is showing fewer and fewer new contracts each month, all the while the number of closing is on the rise. The mystery that we are trying to solve is how can we have more closed home sales following a trend of fewer buyer contracts? If you think you can add to the discussion, please share your comments below. We have ruled out the sales with zero days on the market as a culprit, but there are many others that we will continue to explore now and in future posts.